This web page is about Ztracený svět: Pán temnoty. Sběratelská edice for Windows. Here you can find details on how to remove it from your PC. It is made by Alawar Entertainment Inc.. Go over here where you can read more on Alawar Entertainment Inc.. Ztracený svět: Pán temnoty. Sběratelská edice is frequently set up in the C:\Program Files (x86)\Alawarhry.cz\Lost Lands Dark Overlord Collectors Edition directory, however this location may vary a lot depending on the user's decision when installing the application. Ztracený svět: Pán temnoty. Sběratelská edice's complete uninstall command line is C:\Program Files (x86)\Alawarhry.cz\Lost Lands Dark Overlord Collectors Edition\Uninstall.exe. The program's main executable file is labeled LostLands_DarkOverlord_CE.exe and its approximative size is 2.04 MB (2136584 bytes). The executable files below are installed beside Ztracený svět: Pán temnoty. Sběratelská edice. They take about 10.66 MB (11177145 bytes) on disk. This info is about Ztracený svět: Pán temnoty. Sběratelská edice version 1.0.0.0 only. 1. If you don't have Advanced Uninstaller PRO already installed on your Windows system, install it. This is a good step because Advanced Uninstaller PRO is the best uninstaller and general utility to maximize the performance of your Windows PC. 2. Run Advanced Uninstaller PRO. It's recommended to take some time to get familiar with Advanced Uninstaller PRO's design and number of functions available. Advanced Uninstaller PRO is a powerful Windows tool. Star rating (in the left lower corner). This explains the opinion other people have regarding Ztracený svět: Pán temnoty. Sběratelská edice, ranging from "Highly recommended" to "Very dangerous". 7. Press the Uninstall button. A confirmation window will come up. accept the uninstall by pressing the Uninstall button. Advanced Uninstaller PRO will automatically remove Ztracený svět: Pán temnoty. Sběratelská edice. 8. After removing Ztracený svět: Pán temnoty. 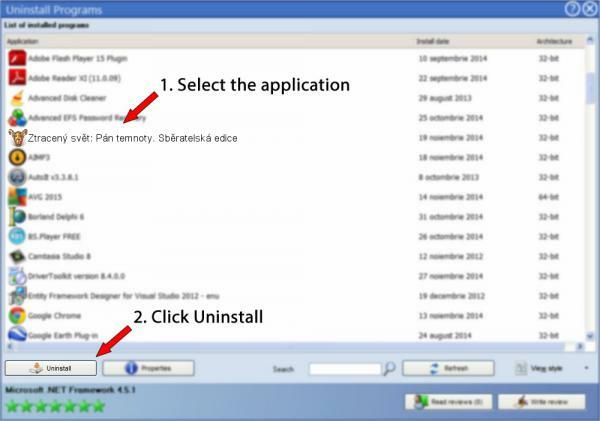 Sběratelská edice, Advanced Uninstaller PRO will ask you to run an additional cleanup. Press Next to perform the cleanup. All the items of Ztracený svět: Pán temnoty. Sběratelská edice that have been left behind will be detected and you will be able to delete them. By removing Ztracený svět: Pán temnoty. Sběratelská edice using Advanced Uninstaller PRO, you are assured that no registry items, files or folders are left behind on your PC. The text above is not a piece of advice to uninstall Ztracený svět: Pán temnoty. Sběratelská edice by Alawar Entertainment Inc. from your PC, we are not saying that Ztracený svět: Pán temnoty. Sběratelská edice by Alawar Entertainment Inc. is not a good application for your computer. This text simply contains detailed instructions on how to uninstall Ztracený svět: Pán temnoty. Sběratelská edice in case you decide this is what you want to do. The information above contains registry and disk entries that other software left behind and Advanced Uninstaller PRO discovered and classified as "leftovers" on other users' PCs.